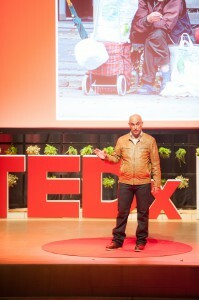 Jamal Mechbal speaks about his homelessness. Jamel was 29 years old when his son was born and 34 when he and his wife got a daughter. He spent about ten hours a day working and made lots of money. They had moved from the Netherlands to Canada,later to San Fransisco and back to Holland again. It seemed a lifetime success. But after his wife left, everything collapsed. He couldn’t cope with the situation and broke down after three years of stress. He lost his job, built up debts and finally lost everything he had worked and strived for, including his children. He worked as a cleaner and he worked in factories, but in the end he was let go. He gaped into a big, black hole. Ouside it was terrible cold in the Netherlands at that time. So he went to a shelter to have a roof over his head. But he hated it! It felt like a prison to him . You had to be out at 9 AM, couldn’t come back until 4 PM and after 10 PM there would be no bed. People around him used drugs and alcohol. He felt completely lost.